Good Morning. Aaron Hicks Is BACK. GOODNESS GRACIOUS! OF ALL THE DRAMATIC CATCHES! 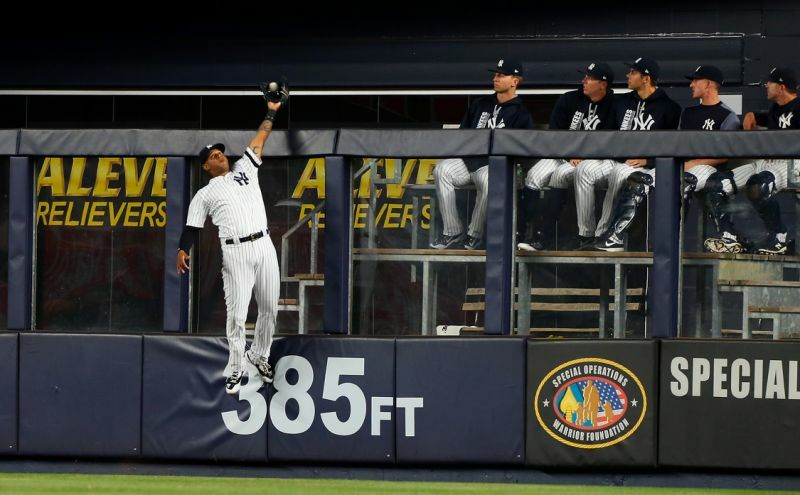 This Yankee season has been marked by a number of breakout performances. Didi developed into one of the five or six best shortstops in baseball and monster in the big moments. Sevy blossomed into an ace and a strikeout machine who I feel 1000% confident throwing out there on Tuesday. Gardner grew into the ideal hardo, clutch vet on a young team that needed it. Gary and Starlin emerged as genuine All Stars. Chad Green and Adam Warren became invaluable relievers. Even that 5’2″ giant of a human being Torreyes materialized into a perfectly versatile, plucky utility guy. And yes, towering over all that was my strongest large adult son Aaron mashing balls through the stratosphere like a young Mickey Mantle except for that month and half stretch that haha lol that was just a bit that wasn’t serious good bit good bit hahahahaha. Add in that a baseball season takes entirely too long and crosses through the point in the calendar where people return to school and to work and try to regain control of their lives after a summer of avoiding reality and treating their bodies like trash and the beginning of the baseball season can feel lightyears away. It’s easy to forget that before his first DL stint Aaron Hicks was arguably the biggest non-Judge story on the Yankees. He had genuinely developed into an all around great player, slashing .314/.423/.571 and playing high quality defense that made it impossible not to play him in what was crowded outfield. After two months on the DL, an underwhelming three weeks back, and then another DL stint for most of the last month, it’s easy to forget that. But now he’s back. And he’s healthy. And he’s the perfect table-setting guy to toss at the top of an already hot lineup going into October as evidenced by three walks and a steal in four at bats last night. He won that game last night. That ball goes over the fence the game is basically over. Mongomery gets knocked out, Girardi has to piece together nine innings from the bullpen. It’s a disaster. Instead he saved three runs, Montgomery settled down and pitched a great next five innings, and the lineup turned around and ripped four runs off the next inning, taking the lead on Hicks’ bases-loaded walk. Wildcard night is one week away folks. Let’s do this thing. Previous Ham’s Hoops Roundup Tues. Sept. 26th — Anything To Talk About From Media Day?